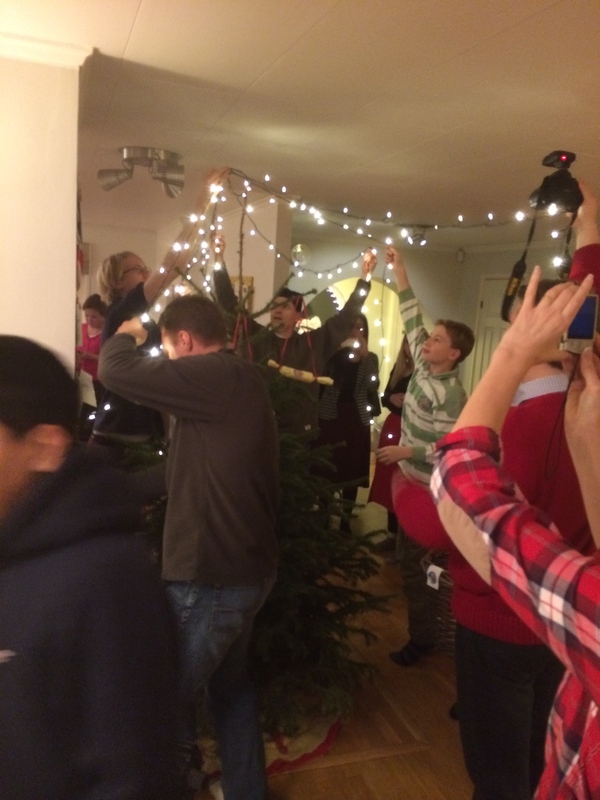 If you haven’t thrown out your Christmas Tree yet, then you still have time to enact one of Sweden’s oldest and most well-known Christmas traditions, Plundering the Tree, Julgransplundring. Think of it as a Viking raid on your Christmas Tree, only with candy. Yeah okay, I’ll explain. Just so you know, it’s about the most fun you can have in a night, aside from Christmas, (which is tough to beat). Here’s what you do…gather up some fun folks. Families, neighbors, anyone Swedish you happen to know. Invite them to dinner; ask everyone to bring a handful of individually wrapped candy. Easy right? 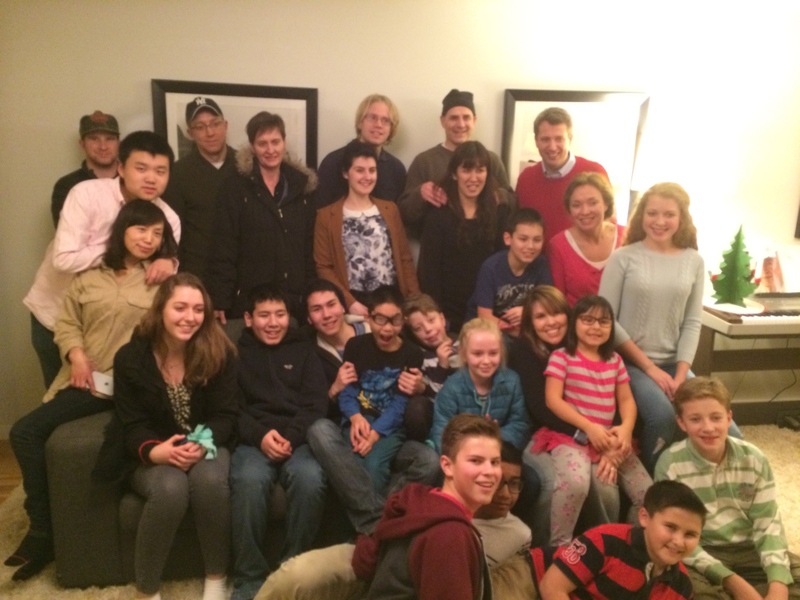 Here’s some of the crew that got together at my friend’s house. To make it easy, serve hotdogs Swedish style with shrimp and mayo on top. Not a fan? Have it your way, beans and cheese or ketchup and relish. The point is to eat pig products. I’m not sure why, but Christmas time is when you eat ham or “korv,” as they call hotdogs and this is more about serving something simple. When everyone has eaten, throw away the paper plates, (if you’re Swedish you’ll recycle). Then get to the good stuff. Everyone lays their candy on a table so each person can select a handful of their favorites and stuff an empty toilet paper roll. Stay with me here…you’re going to make a candy ornament, a smällkaramell. You do this by wrapping the roll in tissue paper and adding colorful stickers and ribbons. 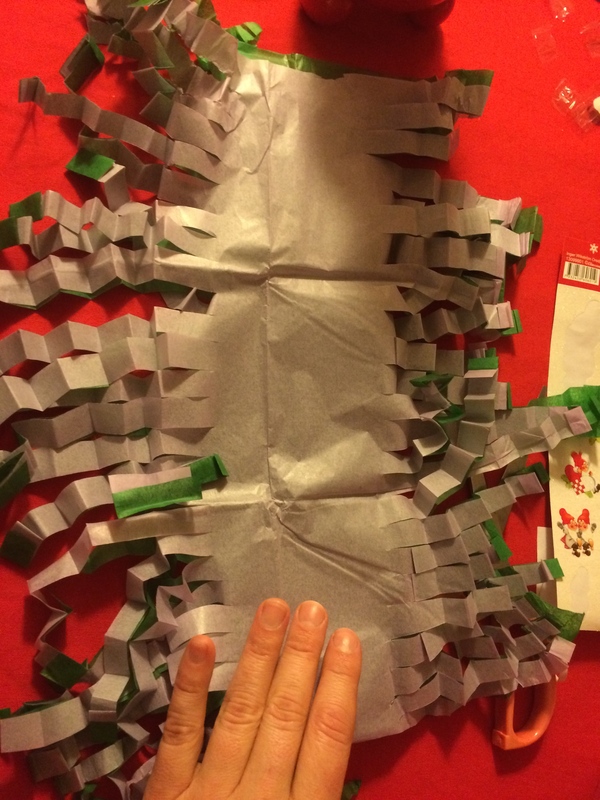 Here’s what the tissue paper looks like before you add the roll. 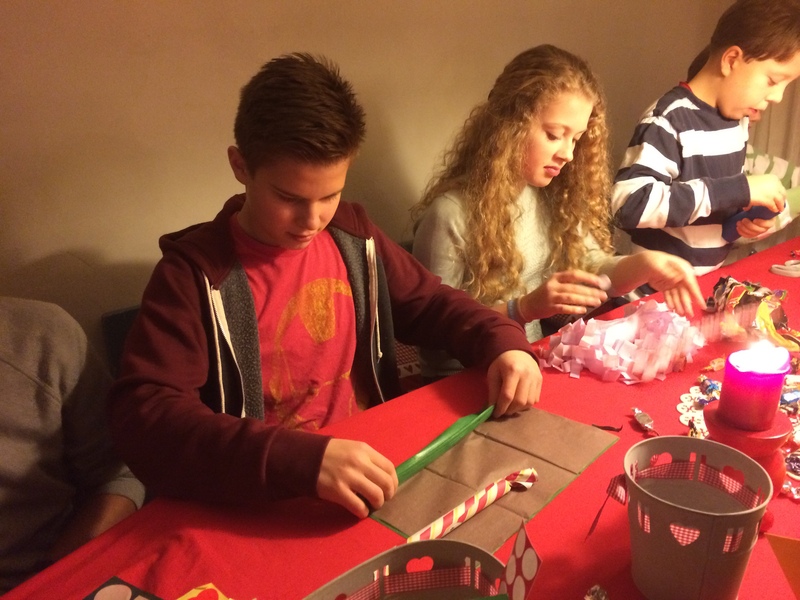 Even the teenagers were happy to get in on this craft project. Here’s a finished one around Maggie’s neck. Now undecorate your tree. Everyone can help. This is handy. Christmas will get put away in a jiffy. Be ready with a basket to collect your decorations, lights too, then pull the tree away from the walls or windows and center it in the middle of the room so you have space to dance around the tree. Here’s our helpful bunch. Everyone puts their candy ornaments on the tree, then forms a circle holding hands. Someone starts the music (that will probably be you), and you all begin dancing! A simple Google search will turn up the traditional songs. Here are two links you can clink on for the most popular ones. Keep in mind the songs are silly kid tales, (the same ones sung at Mid-summer). You won’t achieve enlightenment, but you will have fun. Just sing and dance around and enjoy the occasion. 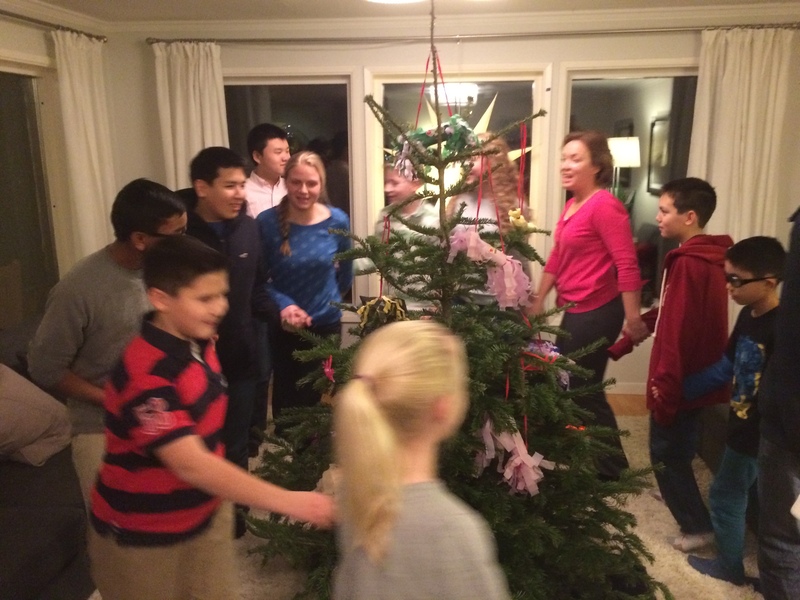 This part of the evening can last for a while…in olden times Swedes not only danced around the tree, they danced through every room of the house and into the neighbor’s house, but unless you’ve forewarned your neighbors, I’d stick to your own rooms, if you know what I mean. Don’t think this is just for kids either, adults have fun too. After about 20-30 minutes, most everyone is ready to collapse or eat candy. So stop the music and do THE ROCKET! Oh my goodness this is loud. This is fun. This is crazy!! This is even crazier if you drink Schnapps (good thing we didn’t, we were all Mormon in this group so it’s apple cider for us). Now stomp your feet and clap your hands, fast, faster, even FASTER, and FASTER, then shout like you’ve just been shot off on a rocket to the moon or you’re on the scariest thrill ride of your life. “Ahhhhhhhhhh!” If the walls aren’t shaking it’s not loud enough. LOUDER!!! Whew! Okay, it’s over. Time to raid the tree! No more rules, (unless you made some up). Get the candy and join the brouhaha or step aside. Dig in and enjoy! With the tree empty, it’s ready to toss, so ask some helpers to finish the job. Unless of course, it’s fake, then don’t. For the grand finale, throw down a blanket on the floor and put your gingerbread house on top (every Swede has one). It’s time to smash the house. Someone with a heavy fist can take a whack. When bits go flying, grab a piece. They made ornaments out of straw as a way to celebrate and give thanks to the harvest. Using the straw to make something beautiful, like a star, paid homage to the great worth of the crop. The other common decorations Swedes make out of straw are goats. Before Santa Claus, it was a goat who brought the presents. In olden times, during the long and restless winters, kids and adults played jokes on one other. For fun, they would attach an insulting note to a rock and throw it in through the neighbor’s open door. Literally, “hurling” an insult. Tomtar are another iconic symbol of a Swedish Christmas. They are short little elfin creatures that bring good or bad fortune to a family. It used to be, if a family’s pig died, or some other misfortune happened around Christmastime, that people would say the family didn’t take care of their tomtar and make him good warm porridge. It was important to feed your tomtar porridge and even today, Swedes eat this rice pudding dish for breakfast on Christmas and all through the season. 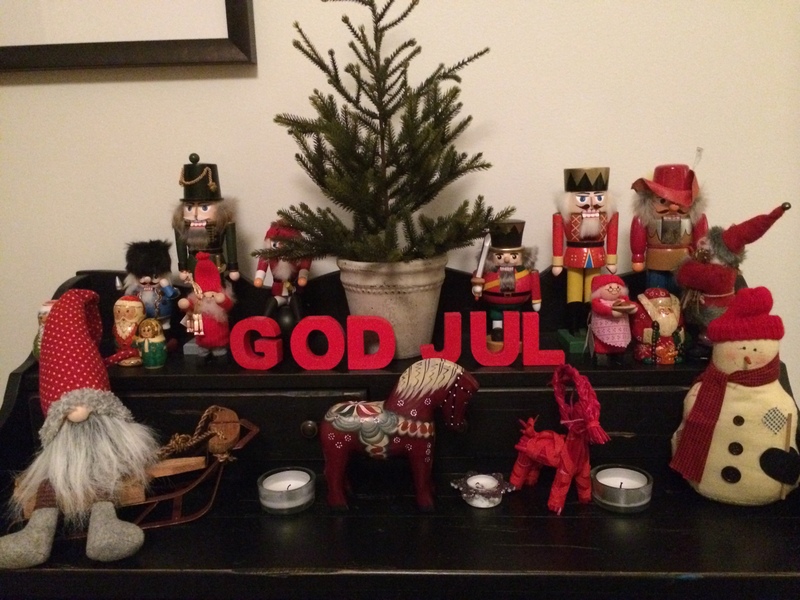 You can see some of our Swedish (and German nutcrackers) on display. Our tomtar is sitting on the left and he ate plenty of candy and cookies for Christmas, in fact I’m blaming him for most of what was eaten. What I love most about these yearly rituals is that they bring people together, both culturally and socially. Traditions are fun, but more importantly, they provide a link for our children to the past and the future. It doesn’t matter what tradition you establish, silly or serious, chose something to create lasting memories with your family and friends. Our traditions often change, depending on which country we live in, but my hope is that one day my kids will look back on Christmas and New Year’s as a time that brought us closer together and gave us a better appreciation for the culture of Christmas all over the world. Enjoyed this post…I think the funniest Swedish Christmas tradition is on Christmas Eve when everyone gathers around the TV at 3 PM to watch Walt Disney’s Mickey Mouse Christmas ! I’m not sure if most people still do this, but my Swedish “kompis” told me he and his family did it when he was boy…and he is in his sixties !! He just assumed we Americans did this, and I had to tell him that we don’t ! Isn’t it funny that the Swedes love Disney’s character?. ” Kalle Anka” is a very popular comic series ( Donald Duck ). 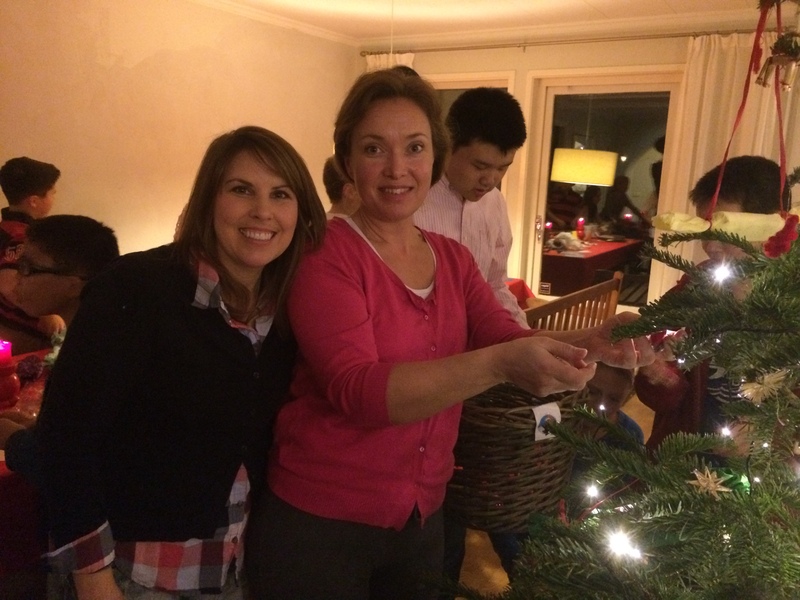 Glad to hear that you and your family enjoyed your last Christmas in Sweden. Sad, though.